does anyone know how to re-activate a c3di file after a crash of CreoIllustrate 1.0? I had deleted a small animation from a figure and I had already a few times the error message from Windows7-64 bit as shown in the attached screenshot creo_absturz_sml.jpg. Today I had a similar situation in an c3di-Illustration with about 6 or 7 figures, when I had deleted a 50 sec approx. animation from a figure and then wanted to save the illustration. 1. Do you removed the Galaxy program which may stay installed after beta testing of Arbortext Galaxy Beta? Remove this program (and folder in "Program Files" if it remains). 2. What service release of Creo Illustrate are you using? 3. Can you attach your "c3di" file to the message? 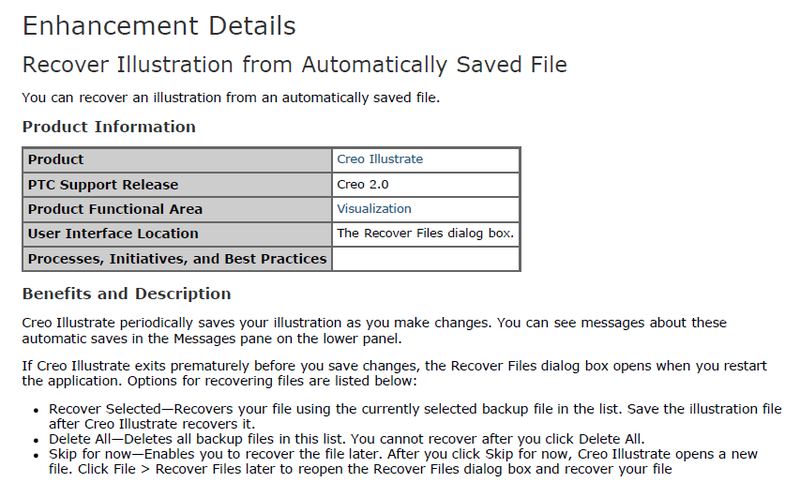 Note that in Creo Illustrate 2.0 available tools for recovering lost files after crash or premature exit. Creo Illustrate now periodically saves your illustration as you make changes. You can see messages about theseautomatic saves in the Messages pane on the lower panel. Recover Selected—Recovers your file using the currently selected backup file in the list. Save the illustration fileafter Creo Illustrate recovers it. Delete All—Deletes all backup files in this list. You cannot recover after you click Delete All. I will attach two files for the information you asked for, but unfortunately I cannot send you the c3di-file. Our company has been scheduled to get the CreoIllustrate 2.0, but until now I cannot find it in our download area, and Regine Mülle is after that. ...I will attach two files for the information you asked for, but unfortunately I cannot send you the c3di-file. Ok. You use Creo Illustrate 1.0 M030 - the latest service release for version 1.0. Of course not. Arbortext Galaxy - it was a separate application. I have the same issue. It's strange, because release of Creo Illustrate 2.0 F000 was on March 14. There is a 'lock' put on each c3di file as it is opened in Creo Illustrate to prevent 2 illustrators working on the same file at the same time. The lock is taken off when you close the illustration, but it would appear that your crash has left the lock in place. I think the easiest solution for you is to manually copy the c3di file (copy, not move) the file and give it a new name. You should now be able to load the new file into Creo Illustrate. Creo Illustrate 2.0 handles this type of situation more robustly and graciously. Thanks Tim. I have opened a case that Peter get the access to Creo Illustrate 2.0. Thank you Tim, I tried it three or four times, copied the crashed file to another partition and into new names, but the 'lock' seems to be not only set, but even blocked or destroyed. Opening the copied, renamed files produces the same error msg as in the original file. I'm looking forward to working with the new version 2.0. I realized, that version 1.0 easily crashes on my machine, when I delete animations from a figure and continue working, although the sign keeps on turning in the right upper corner next to the help symbol. Nevertheless I could even export animations to wmv, while in this program state. But I could not exit form creo illustrate without the crash message at the end - so no 'save' was possible. Hope, that information might be useful for further investigation. I recommend to you to create a new "Case" and describe your issue with Creo Illustrate for PTC's technical support, here: "Log a New Case".